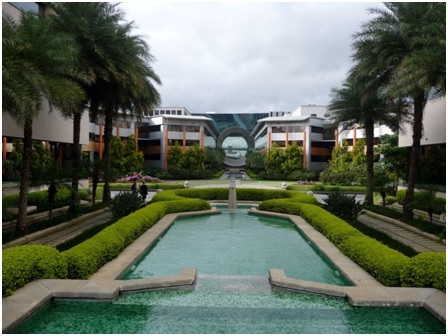 The campus in Bangalore is simply amazing. All interns are given accommodation and free cab rides so they can visit the surroundings. I get to walk through beautiful gardens, fountains and futuristic buildings on my way into the office. There’s a gym, swimming pool, shops, restaurants… everything an internship participant needs. And I’m based at the “smaller” campus. I’m told Mysore is about four times the size! I should also note that as they always do, the company covered my return flight and visa fee to India and paid a monthly stipend. In fact, the InStep Programme has even been recognised in the category of “best large organisation with over 250 employees” for “Work Placement of the Year 2013” by the National Council for Work Experience (NCWE). 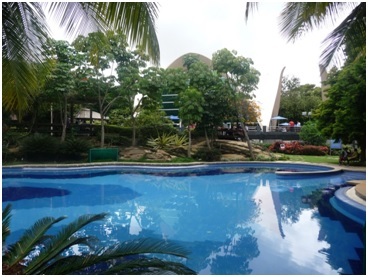 (Swimming pool on campus next to the gym and the billiard area). The InStep Internship participants exclusively come from top universities all over the world. And from my observations, I think Infosys not only puts a lot of effort into building a community of interns but also into having the interns network with very strategic people at the organisation. So far I have met the Chief Financial Officer (CFO), the Head of Strategy, the Head of Infosys Germany, the Head of Infosys France (to name a few) and of course, Mr Murthy himself! The summer internship cohort has also been invited to a number of conferences where even more networking is possible. Interns are here to make an impact. We’re asked to come up with innovative ideas the corporate and planning teams can adopt into their business strategy from September. The programme itself is really exciting, but for me the highlight has been the business model competition. Interns are given a limited set of topics on issues Infosys is facing. Then they form into self-selected groups of four. This year we had 23 teams competing! I found this to be a very challenging and fun way to quickly learn about Infosys’s business. $2,000 (USD) plus breakfast with Mr Murthy. In the final, there were four groups with one MBA in each: Cambridge CJBS, Kellogg, Oxford and Stanford. My team’s business plan was very disruptive and we were able to back up all of our assumptions in a very short time. It was really exciting to listen to the other ideas. They were all very innovative. I wasn’t sure we could beat out such high quality work… but we did! I can’t tell you how much confidence it gave me in my skills and in the quality of my education. 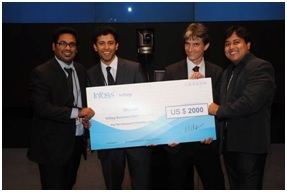 (InStep 2013 Business Plan Competition Winners Kurian Abraham, Niloy Biswas, Laurent Liou and Dattaya Raychowdhuri). Next day all finalists were invited to meet Mr Murthy. He is a humble man, very charismatic, but clearly, a skilled businessman. He asks thoughtful questions and gets right to the point. During my exchanges with him I was able to learn from his extremely valuable experience. In fact, the InStep Programme I participated in was initiated by Mr Murthy and he takes great care that the interns have the most amazing experience the internship can provide. I can honestly say that the InStep Programme exceeded my expectations. It was the perfect way for me to utilize my engineering experience and my MBA in a country that is so important to the global business market, India. In ten days, my internship will be over. So will my MBA. At this point in time, I would say I have been able to achieve what I came to Cambridge JBS to do. I wanted my MBA to not only help me remain competitive but springboard me into my next challenging role. CJBS offered me the platform for this. More importantly, participants need to recognise their individual opportunities and grab them when they present themselves. What’s next for me you ask? I’m currently looking around for my post MBA company but before my next journey begins, I’ll be celebrating the end of a fantastic year with a two week holiday in Greece with my lovely wife.